Have you been waiting for a online networking site for handmade artists? One where we can meet each other and handmade supporters? Me too! Guess what? It now exists! indiepublic is “an independent and design community” that just started over on the ning site. (Ning also hosts a huge variety of other networking sites, including an Etsy Lovers community.) I’ve already started my own page on indiepublic and love that my profile asked me all the important indie designer questions like my favorite artists and where you can find my work. Seriously. Awesome. 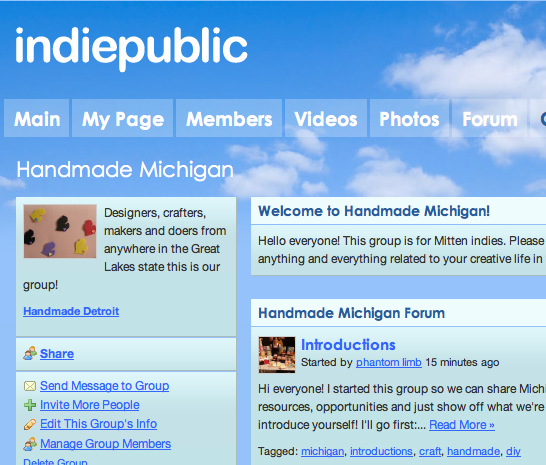 When you get over there, make sure to stop by and join the Handmade Michigan group, too. It’s not just for Detroit, it’s for everyone in the Great Lakes state to share, meet and celebrate our awesomness. Very cool! I didn’t know about the We love Etsy Network. Thanks for the info, I just joined there! just a warning: to participate, you must first be “accepted” into the community, which seems to take forever. i’ve been waiting for about three weeks, and beginning to wonder whether they are leaving me hanging instead of just flat-out rejecting me.